Homewatch CareGivers franchise locations provide home care and personal assistance to individuals who are aging, disabled or rehabilitating, which allows clients to remain living independently at home. Through training and ongoing support from our team, each Homewatch CareGivers franchisee is equipped to deliver the exceptional care and proprietary programs that provide peace of mind to clients and their loved ones. 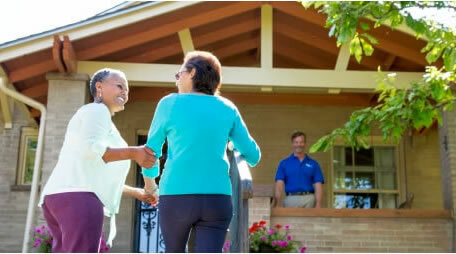 These are just a few of the advantages that come with being a Homewatch CareGivers franchisee. Founded in 1980 as a premier provider of home care services, Homewatch CareGivers now consists of about 200 franchise locations in six countries. Our business model is proven to generate in-market success against our competitors by offering a better approach to care, better business intelligence tools and a more efficient client acquisition model. And, the aging Baby Boomer population will sustain our rapid growth in the industry. We were named a top franchise for Veterans by the Military Times in 2017. Please fill out the Request Info form to learn more. Please call Matt Burns directly at (775) 376-2113. Homewatch CareGivers is currently accepting inquiries from the following states: Alabama, Alaska, Arizona, Arkansas, California, Colorado, Connecticut, Florida, Georgia, Hawaii, Illinois, Indiana, Iowa, Kansas, Kentucky, Maine, Maryland, Massachusetts, Michigan, Minnesota, Mississippi, Missouri, Montana, Nebraska, Nevada, New Hampshire, New Jersey, New Mexico, New York, North Dakota, Ohio, Oklahoma, Oregon, Pennsylvania, South Carolina, South Dakota, Tennessee, Texas, Vermont, Virginia, Washington, Washington, D.C., West Virginia, Wisconsin, Wyoming.